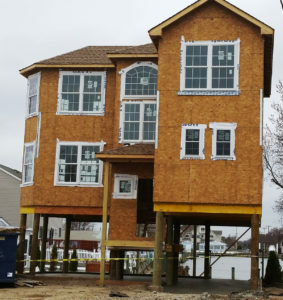 We understand there is a lot of information regarding house raising in New Jersey, including prices, timelines, how to find reliable New Jersey house raising contractors and what the process is like. We try to remain one of the leading New Jersey house raising contractors by providing homeowners like you with the valuable and relevant information you need to make smart decisions about the future of your home. While we will attempt to answer most of the Frequently Asked Questions (FAQ) on this page, there will invariably be some that we do not cover. If you do not find an answer to your question here, please call us and we are happy to help you out. How Do I Find My Advisory Base Flood Elevation (ABFE) Zone? It is important to understand which zone your home is in because that will help you determine how high you may need to lift you home. You can find your home’s ABFE Zone on the FEMA website. What Is A FEMA A Zone? An A Zone is an area subject to storm surge flooding, but not necessarily high velocity wave action. These are still considered high risk flooding areas in the event of a coastal flood. What Is A FEMA V Zone? A V Zone is an area that is subject to storm surge flooding and is also subject to high velocity wave action (3 foot or greater breaking waves). V Zones are subject to stricter rebuilding and house raising requirements than other zones. How Much Does It Cost To Raise A House At The Jersey Shore? There are obviously many variables involved, such as the size of your house, location, the current foundation, the foundation you need to be in compliance and several others. A full service house raising quote will come in somewhere in the $40,000 to $150,000 range, which includes everything from permits, lifting, general contracting, reconnecting all utilities, decks, porches, stairs, internal and external repairs and so on. The actual cost to raise and lower the house from a house raising company will probably be $12,000 to $30,000 of that, but there is much more that goes into the turn-key service than the actual lift, which you can read about here. 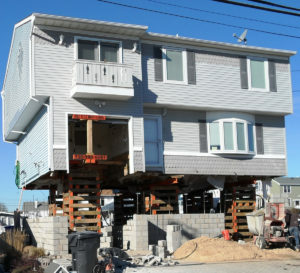 What Is The Process For House Lifting At The Jersey Shore? As noted above, there are many steps to properly raising a house in New Jersey. When you look at the list below, you can begin to see how things add up and why you want to hire an experienced and reputation Jersey Shore house raising contractor, such as A TruBuilders. Can I Live In My House While It’s Being Raised? Unfortunately, you will need to find another place to live while the work is being done to your house. There is just too much going on, not to mention no utilities, while we are in the process of lifting, for you to live in your home comfortably and safely. How Long Does It Take To Raise A House? The full process takes anywhere from 4 to 8 weeks once we begin. We have developed the systems and processes to make this as smooth as possible and get you back into your home as soon as we can – we know you are anxious! What Areas Does A TruBuilders Service? Great question! We are a full service general contractor and house raising company based in Lacey Township in Ocean County, New Jersey. We operate up and down the Jersey Shore, which for us includes Monmouth and Ocean Counties, including Lacey Township, Lavallette, Toms River, Berkeley Township, Brick, Mantoloking, Little Egg Harbor, Barnegat, Manahawkin, Long Beach Island, Manasquan, Brielle, Sea Girt, Spring Lake, Belmar and Avon. This Information Is Great! How Can We Hire You? Another great question! We look forward to helping you get back into your home, whether that means assisting with the NJ RREM Program, helping you with financing options or actually doing the work. Please contact us to set up a free estimate.